It’s common to conflate IT infrastructure monitoring with IT operations management. While infrastructure monitoring has long been the first line of defense against system-wide outages, there’s so much more to IT operations management than just monitoring. To remain relevant in the age of digital transformation, IT teams will need to shift from reactive and static monitoring to proactive and innovative digital operations. Why Is It Difficult To Detect, Diagnose and Address Issues With Monitoring Tools? For years, enterprises have invested in siloed monitoring tools for managing their IT infrastructure. While monitoring tools are great for specific use cases, most point tools lack the holistic visibility and control that you need for delivering a single pane of glass experience. Availability and Performance. How do you manage the health and performance of IT services hosted across datacenter, private clouds and public clouds? Can you monitor dynamic apps and services built on ephemeral cloud-native services? Cloud Cost Management. Can you efficiently track the cost of hosting enterprise services across public cloud providers like AWS, Azure and Google? How do you avoid receiving an inflated bill from your cloud provider at the end of each month? Chargeback and Analytics. How do you quickly analyze multi-cloud cost trends over time? Can you slice and dice cloud cost consumption data by instance types, service categories or cloud regions? Reduce Downtime. Can you aggregate and contextualize alerts and events across your hybrid infrastructure and application monitoring tools? Are you able to pinpoint root cause(s) for an outage, without having to switch between ten different tool consoles? Just-In-Time Notifications. Can you notify the right subject matter experts across your global teams during a critical outage? Do you have the ability to set up on-call schedules and escalate issues when a team member is not available? Service Level Management. Are you able to automatically create incidents in your favorite service desk tools like ServiceNow or BMC Remedy? Can you manage incidents till resolution across different teams, processes and tools? Remote Access Management. Do you have internal groups, external service providers and technology vendors accessing your production environment? Can you track every single keystroke action on your production systems? Vulnerability Remediation. Do you know which patches you need to install across your enterprise server fleet? Are you able to push a button and deploy missing Windows and Linux patches for safeguarding your infrastructure? Standard Operating Procedures. Do you have a consistent way of addressing repetitive and common IT management tasks? Can you schedule jobs and complete tasks in a repeatable manner with custom workflows? You’ll need a new set of skills, technologies and processes to be successful at modern IT operations. It’s time to go beyond domain-centric infrastructure monitoring and invest in a new platform that can help you balance speed and risk at an enterprise scale. 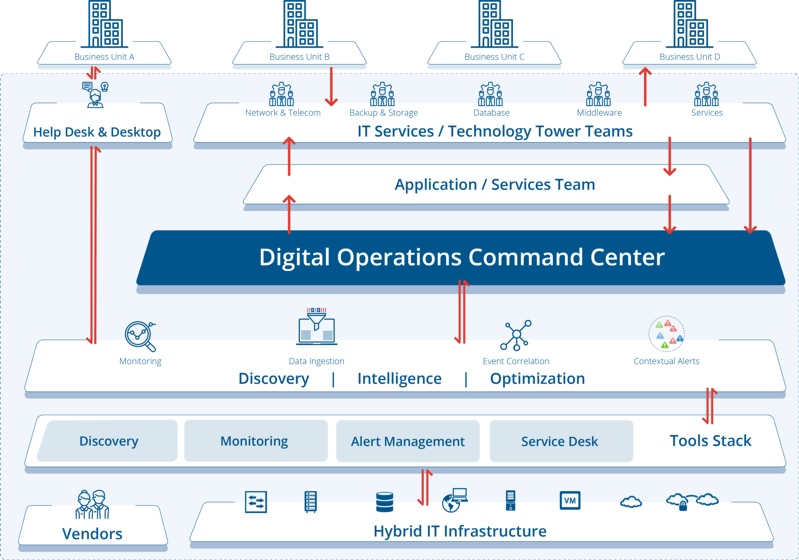 Embrace a new level of visibility, productivity and governance with OpsRamp’s Digital Operations Command Center so that you can accelerate innovation and optimize service delivery. Figure 1 - Drive scalable enterprise IT operations with a multi-tenant SaaS platform. Multi-Cloud Visibility and Control. OpsRamp’s multi-cloud visibility dashboard delivers much-needed clarity on the different cloud services that you're consuming with the ability to manage cloud budgets across business units. Efficiently address the challenges of multi-cloud management while keeping a handle on your cloud budgets. Real-Time Incident Management. Our intelligent incident management capabilities help you maintain service levels for critical IT services and avoid disruptions by resolving IT incidents promptly. Manage the health and performance of digital services and coordinate incident response across your enterprise. Compliance-Driven Operations. OpsRamp’s compliance-driven operations framework enables consistent processes and organizational readiness for your digital business. Improve service delivery and support agility while ensuring stability, security and compliance of your IT operations. With OpsRamp, it’s now easier to switch from a monitoring-first approach to a modern IT operations strategy that’s focused on business relevance, and not just NOC-watching. Read our white paper, Why Infrastructure Monitoring Is Not Enough: Control The Chaos With A Digital Operations Command Center to see how you can improve the speed, quality and reliability of enterprise IT services that you deliver and support. Learn how you can control the chaos and modernize your IT operations with OpsRamp. Dig into the OpsRamp platform and see how you can manage the unmanageable. Schedule a custom demo with an OpsRamp solution expert.